Divide the spinach and beet greens evenly among four plates, arranging them around the plate. Top with beet quarters and blue cheese. Drizzle the salads with a little olive oil and some balsamic vinegar. Beets are the sweet, dark crimson jewels of summer that are fabulous boiled, steamed, roasted and even raw. But their poor greens are so often overlooked. Once, at a farmer’s market, a farmer offered to “take care of them” for me – as in remove and dispose of them. While I appreciate the gesture (especially since they likely would have become compost), I declined … and was a little surprised. After all, beet greens are edible and delicious. They aren’t sweet like the beets themselves but rather bear a resemblance to a combination of romaine and chard. If you haven’t tried them, you should. Beet greens can be used in soups, sautéed like other greens or served raw like in my Easy Beet and Greens Salad. This fresh spring and summer salad is perfect for a light lunch. 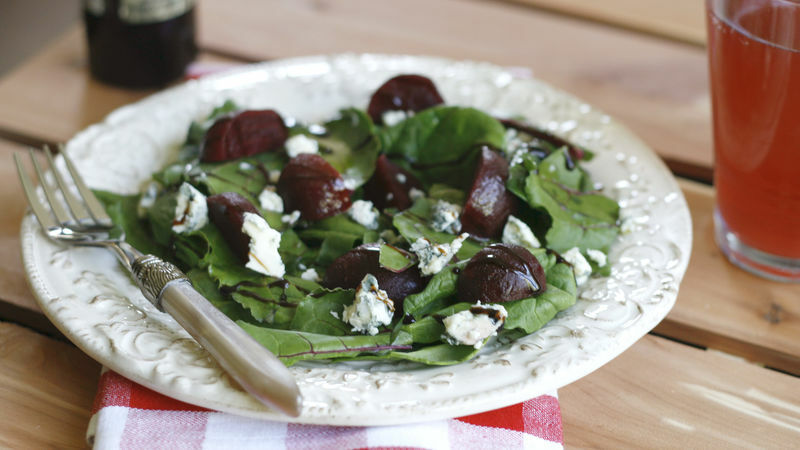 Baby spinach and torn beet greens make the bed of this salad. Then it’s topped with sweet steamed beets (boiled are ok too) and sharp blue cheese. Finally, dress it all up with a light drizzle of olive oil and good balsamic vinegar. When I say good balsamic vinegar, I really mean it. There are lots of sub-par options out there that have more tart bite than body. Those are ok for marinating or even some cooking applications. But for a salad, it’s totally worth it to spend the money to buy a balsamic vinegar that you love. Look for stores that let you try a taste before you buy it – that way you can test the flavor on your palate before dishing out $10 or more for the bottle. If you like beets, get your fill with beet recipes like these that will color your summer delicious.